William Henry Robey was born on 5 October 1834 at Alderbury, Wiltshire, England, son of William T Robey. On 10 September 1863 he married Eleanor Gray at Mittagong. There were four daughters and three sons of the marriage. He died at Hazelbrook on 30 September 1921, aged 86 years. Eleanor Robey died on 30 August 1928, aged 81 years. Joining the British Navy in 1851 Robey arrived in Sydney in the late 1850’s. He survived as a master carrier in Glebe from about 1873 in an increasingly competitive horse cartage industry. Small self employed proprietors of one and two horse carts found it difficult by the 1890’s to compete against Glebe carriers John Meloy and William McKeown with twenty five to forty five horses; most did not survive and became employee drivers for the large horse-drawn carriers. As a layman of Glebe Methodist Church, William Robey was part of a delegation led by Mayor Artlett to the Chief Secretary protesting in 1911 against a new picture show operating on Sunday evening. 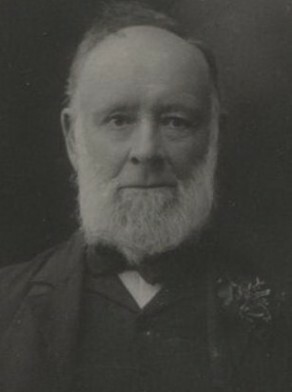 He was Superintendent of Glebe Road Wesleyan Sunday School from 1878 to 1880. Robey, Worshipful Master of LOL Daughters of the Diamond No 316, chaired Orange Lodge celebrations at Glebe in 1906. Orange lodges were secret societies for Irish Protestant self-defence and preservation of British rule, and a crucible for religious tension. William Henry Robey was an alderman on Glebe Council from 1897 to 1916. The early years of Federation was a time of heightened sectarian tension, and formation of a strong alliance between militant Protestantism and the Liberal Party. A crowded meeting at Glebe Town Hall in September 1902, was chaired by Robey who outlined of the obects of the newly formed branch of the Australian Protestant Defence Association, the layman’s response to the alleged Catholic menace; 240 members were enrolled, with Robey a committeeman.